extended project boundary for the years 1984 to 2012. On Tuesday, June 11th, the CWPPRA Public Outreach staff traveled to the Louisiana Department of Wildlife and Fisheries Marine Research Lab in Grand Isle, Louisiana to discuss Louisiana wetlands with teachers from around the state. The teachers participated in WETshop: a week-long, dynamic teacher workshop that allows teachers to work with educators and scientists to learn about Louisiana coastal wetlands, issues, and history. The focus of the summer workshop is to create wetland stewards of teachers in order for them to educate coworkers and students in their home parishes about coastal land loss. The workshop was sponsored by the Louisiana Department of Wildlife and Fisheries and the Barataria-Terrebonne National Estuary Program. 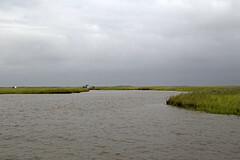 During WETshop, the teachers get a firsthand look at the importance of wetlands through visiting coastal ecosystems, water quality testing, marsh tours of coastal restoration sites, and the opportunity to learn about fisheries management, coastal botany and ornithology, and invasive species. The Coastal Wetlands Planning, Protection, and Restoration Act’s Public Outreach staff participated in WETshop as coastal wetland educators. CWPPRA provided each of the twenty teachers with packets containing numerous publications and teaching resources, as well as posters from CWPPRA’s #ProtectOurCoast campaign. The public outreach staff also gave a presentation that highlighted causes of land loss, benefits of wetlands, CWPPRA’s history and success with projects, the Coastwide Reference Monitoring System, and different ways teachers can access and utilize wetland teaching materials. Visit CWPPRA’s Education page to access coastal teaching tools.